This bronze statue marks the entrance of the French institute for higher education of riding instructors and training of national teams, the Ecole Nationale d’Equitation in Saumur-Terrefort. The top instructors constitute the Cadre Noir. The statue shows a regular riding horse without striking features, just as the school has several hundreds of them. Nevertheless this model has an exemplary conformation. The artist has marked the spots on the body where articulations are moving or skin is moving by narrow gaps in the bronze surface. In this way the movements of the horse are highlighted and that hints at the essential work of the school. This horse also resembles a model for artists. 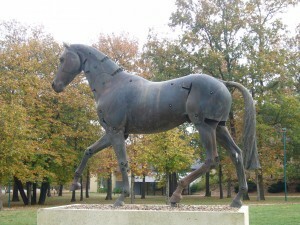 The artist has made several other works with horses: Archeval, 1999 (A85, Saumur), Cheval d’Aytré 1989 (Place et Fontaine Publique), Pégase no.2, hommage à Léonard, 1992 (BERD, London), Pégase, renaissant, 1988. This gallopping horse has been rendered in a realistic position: the moment of suspension. The position of the legs is not completely correct, but the artist has catched the suspension moment, which hardly any artist did before 1872, when Marey published his graphic experiments, subsequently confirmed by the photographs of Muybridge. There are no signs of any harness on this horse, so it may have been a free running horse. A wild horse is unlikely in Greece and the manes have been made up just as is done in harness horses. The statuette was used to decorate a vessel. It is included in G.E. 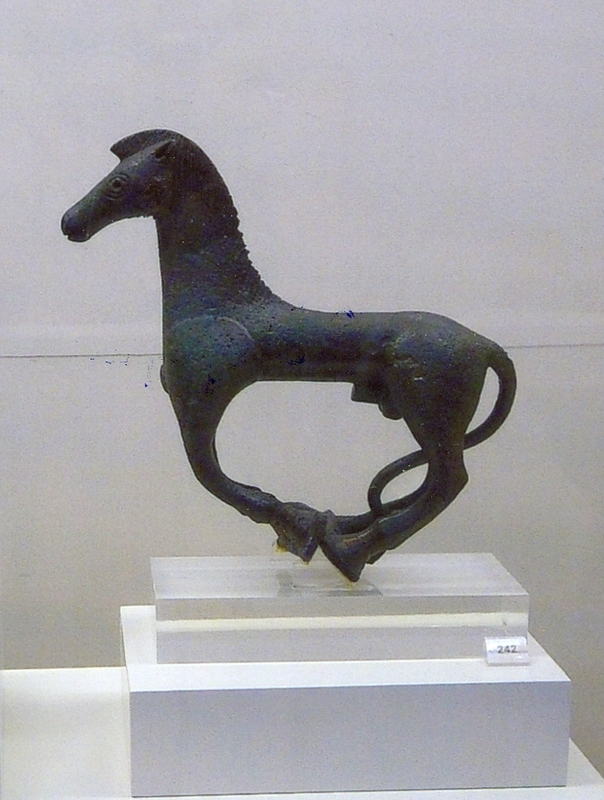 Hatzi, The Archaeological Museum of Olympia, John S. Latsis Foundation, Olympia, ca. 2004, page 196. Boudewijn Commandeur. On February 18 the newspapers reported about an armed robbery at this museum in Olympia on February 17, whereby about 60 bronze statuettes and a gold ring were stolen. This picture of the galopping horse could well be among them !